An alien menace has descended on Earth! Defend the world from UFO invasion in this superb arcade shooter from Qute. Use your weapons effectively, deflect enemy bullets with your shield, and recapture the Moon from alien infestation! The year is 21XX. A mysterious alien force, known only as "Purple Erosion", has taken over the Moon! From the captured lunar base, alien UFOs begin their invasion of Earth! Using your advanced space fighter, you must repel the alien invasion, beat them back through space, and finally recapture the Moon to end the alien menace once and for all! Enjoy a superb arcade shoot 'em up with this new classic from Qute. 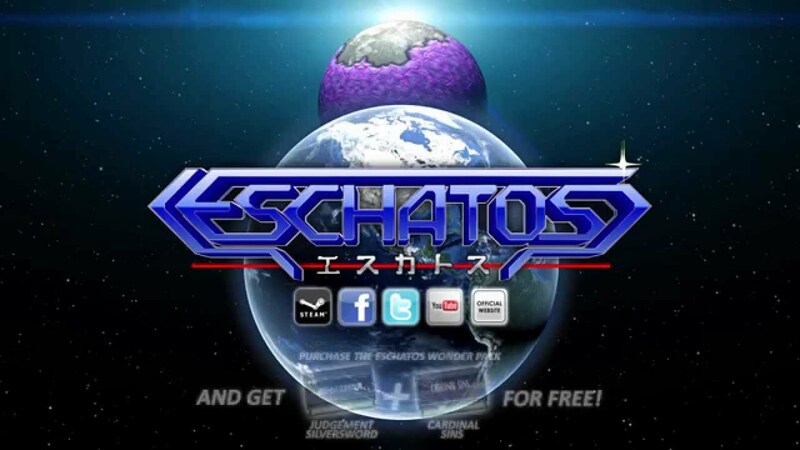 ESCHATOS combines modern features and graphics with classic gameplay to create a game with timeless appeal and massive fun factor. Multiple game modes and enjoyable difficulty settings for all levels of player skill. Choose from Original, Advanced, or Time Attack modes. Intuitive and fun scoring system with a high skill ceiling! Scramble to wipe out the enemy waves as quickly as possible in Original mode, manage risk and reward in the challenging Advanced mode, and outrun the time limit in Time Attack mode. High score chasers are welcome! Multiple weapons add strategic depth. The Front Shot is powerful, but has a limited firing angle. The Wide Shot can hit many enemies, but has short range. Finally, the Shield can inflict heavy damage and deflect bullets - but at perilously close range! Utilize all of them to get the best results, and don't let the enemies get away! The dynamic camera system creates a sense of exhilarating speed as you explore 5 beautiful stages, including temple ruins, Earth's orbit, and the alien moon base. Encounter massive bosses. Battle screen-filling UFOs and other strange enemies! Check out the top players on the online leaderboards, or share your best run with a friend using the downloadable replay system! Turn up the volume and enjoy a phenomenal retro-synth soundtrack composed by Yousuke Yasui! Processor: Dual-core processor running at 2.0GHz or higher. Graphics: NVIDIA GeForce GTX460, AMD RADEON HD5700 or better.